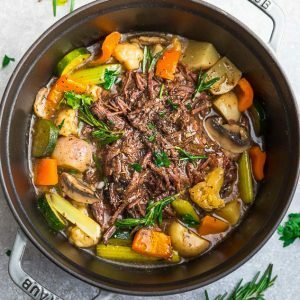 This keto pot roast recipe is hearty, flavorful and easy to make in your Instant Pot pressure cooker, dutch oven or slow cooker. Tender beef is made with low carb vegetables in a juicy and delicious gravy. A classic Sunday dinner the whole family will love. Once the weather gets cold, comforting meals like beef stew and pot roast show up at the family dinner table. We go over to mom’s house every Sunday evening for dinner. She always makes a humongous dinner including a tender and juicy beef pot roast with carrots, potatoes and celery covered in a delicious gravy. The meat is tender, juicy and my kids say that it’s the best pot roast ever. My recipe for keto pot roast combines all of those classic flavors of mom’s pot roast. 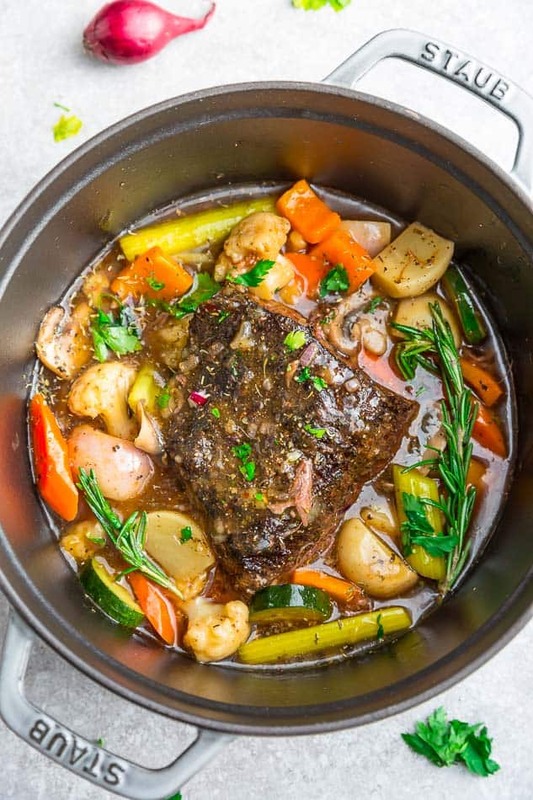 But instead of the regular root vegetables you find in a classic pot roast, we’re going to be cooking this keto pot roast with low carb vegetables like turnips, rutabega, mushrooms, cauliflower, zucchini and bell peppers (optional – feel free to use carrots if they fit into your macros) for some color. Turnips and rutabega are a great substitute for potatoes but instead they are lower in carbs so they fit perfectly into a low carb / keto diet. 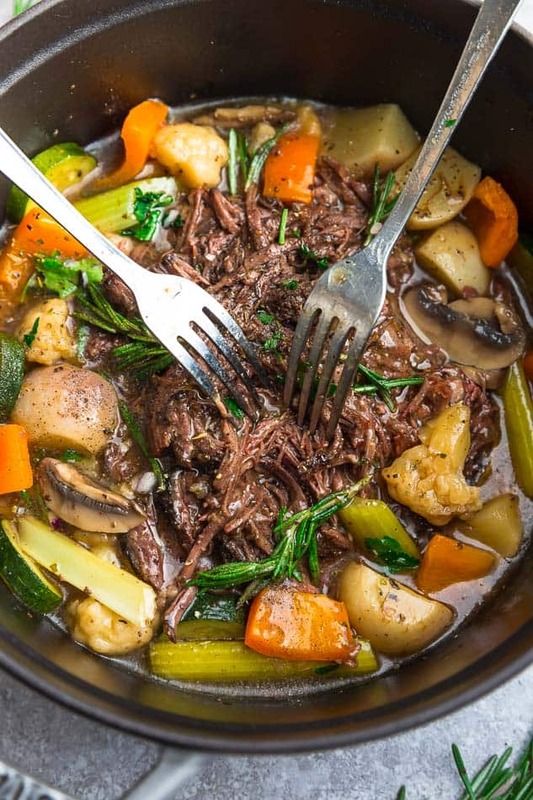 What’s even better is that this delicious pot roast is sugar free, gluten free, paleo friendly and Whole30 compliant. And if you’re not following a keto diet or concerned about carbs, you can certainly add potatoes and carrots instead like this version I made for the other members of my family. 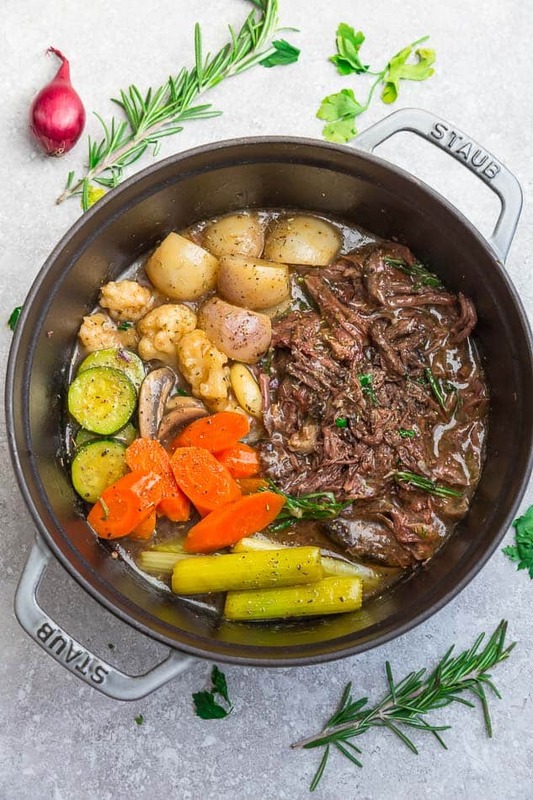 While most people make classic pot roast on the weekend, now that we have the Instant Pot, that means you can skip the hours it takes to slow cook the roast on the stove or in the oven. 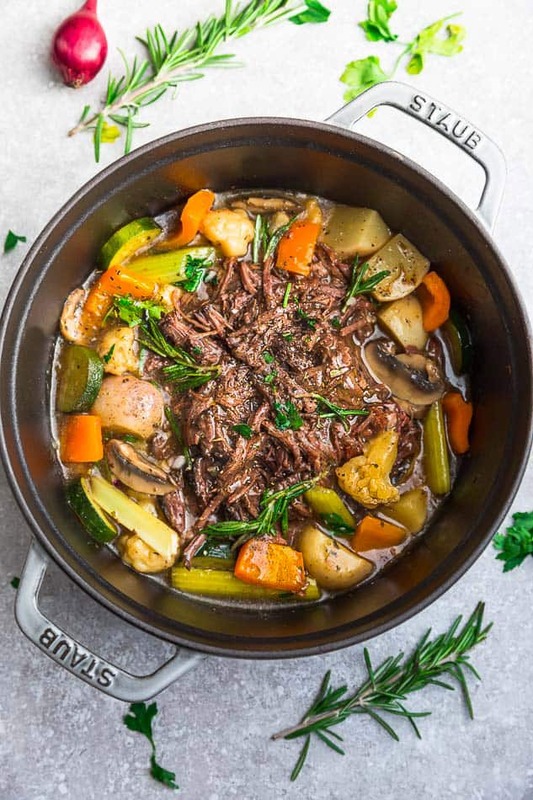 Making low carb pot roast in the pressure cooker means that you can have dinner ready in an hour with fork tender meat in a flavor packed gravy. 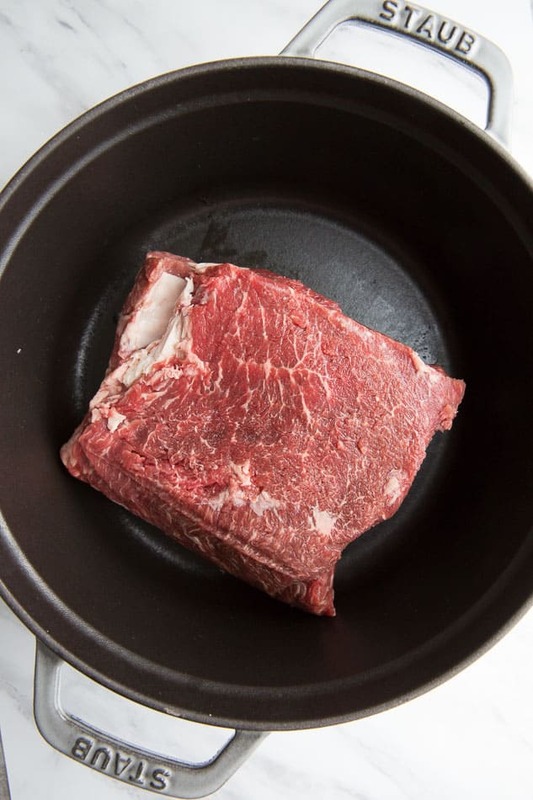 Boneless beef chuck roast or chuck shoulder is the best kind of meat for pot roast (also what I use), as it contains more fat and connective tissue, so it’s more flavorful. If you can’t find beef chuck roast, then a rump roast or round can also be another option. It’s a little bit more expensive than chuck roast and less fatty. And third, beef brisket can also be used when you’re making a pot roast, but the texture is somewhat more grainy than chuck. 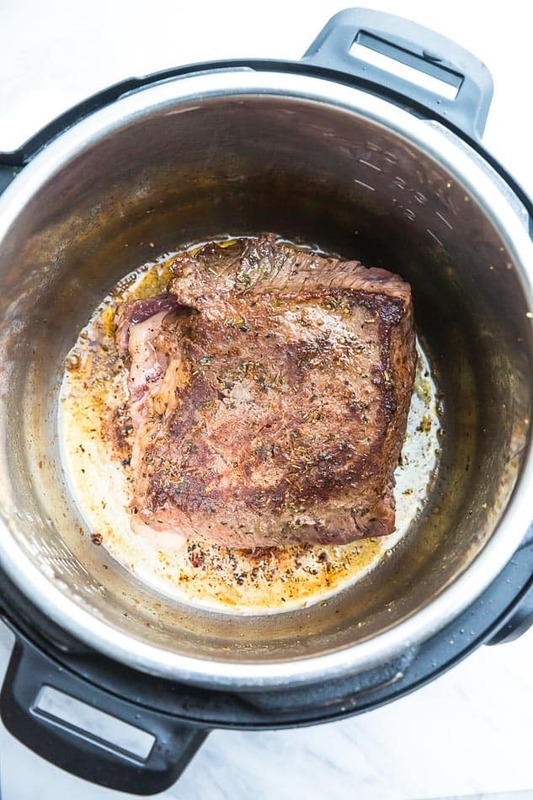 This recipe for Instant Pot Pot Roasts starts with a good seasoning of the roast with salt, black pepper, garlic powder and Italian seasoning. Be sure to allow the roast to rest for about 30 minutes. CAN POT ROAST BE FROZEN? The great thing about pot roast is that it freezes beautifully so it works great for meal prep. After you’ve shredded the pot roast, allow it to cool to room temperature then transfer the meat into an airtight container or freezer bags along with the gravy. Store flat in the freezer for up to 3 months. 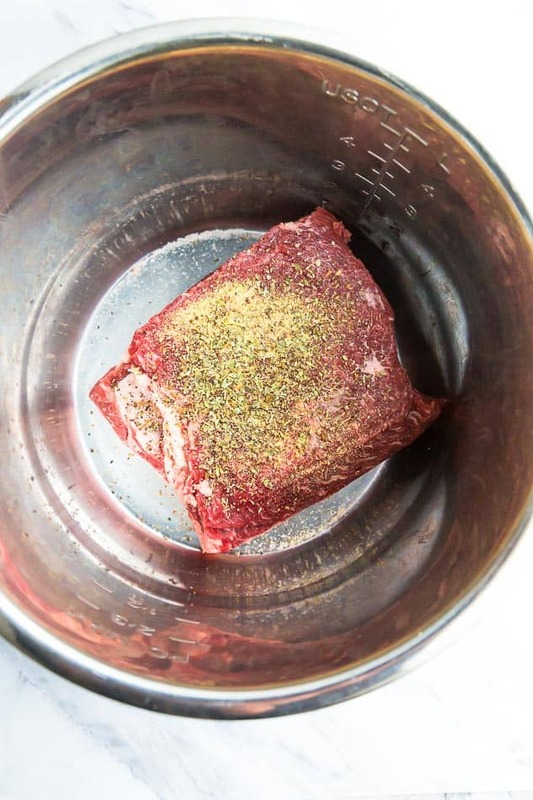 Start off by seasoning the roast with salt, black pepper, garlic powder and Italian seasoning. Be sure to allow the roast to rest for about 30 minutes. TO THICKEN THE GRAVY (OPTIONAL): Turn the slow cooker to HIGH and add xanthan gum to the reserved gravy. Allow to heat and thicken up. Adjust seasonings as needed. 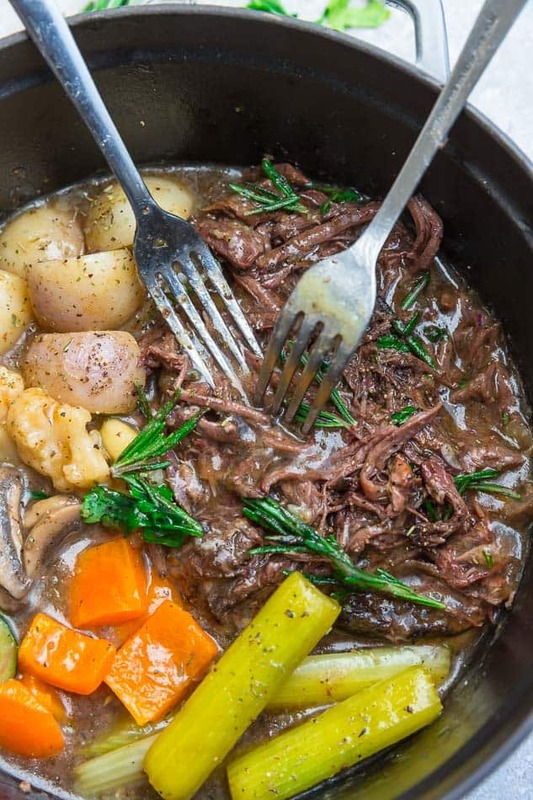 Serve over pot roast. SO HOW DO YOU REHEAT FROZEN POT ROAST? 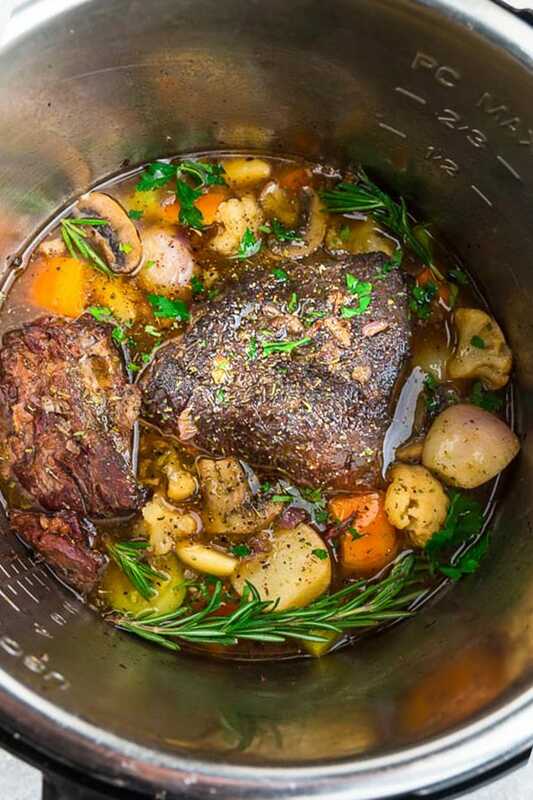 When you’re ready to reheat the pot roast, you can simply dump the contents into a pressure cooker and PRESSURE COOK on LOW for 4 minutes or in a dutch oven pot on medium low heat until it boils. 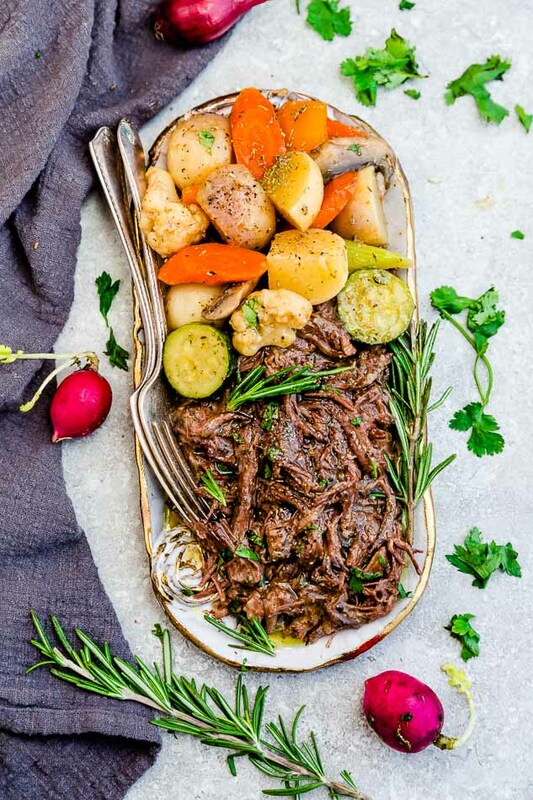 WHAT CAN I SERVE WITH POT ROAST? 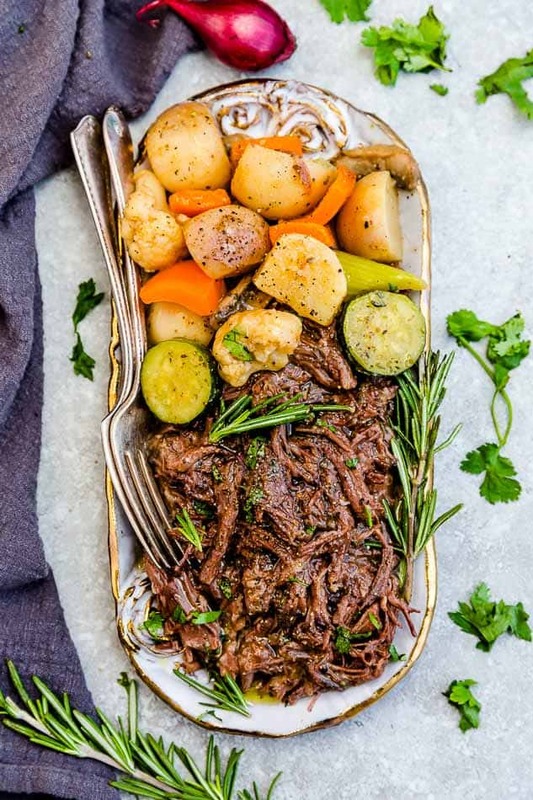 Low carb pot roast goes well with so many sides. 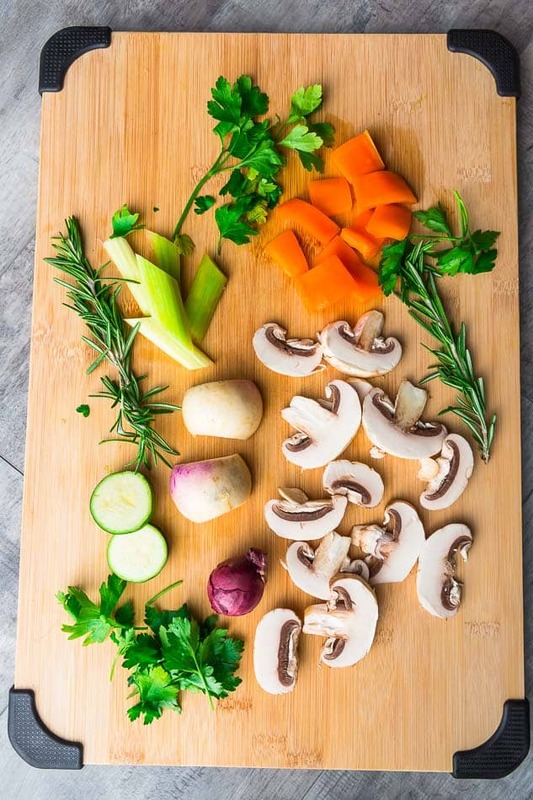 Aside from the turnips, cauliflower, zucchini and mushrooms that you see on this plate, you can serve the roast with mashed cauliflower, roasted broccoli or any other roasted veggies you like. And for a classic pot roast version, feel free to add some mashed potatoes, baby potatoes or carrots. * Please note that I use the Instant Pot 6 Quart DUO Plus and the cook times are accurate for this model. * To cook this in the slow cooker or your dutch oven, please see the post for detailed instructions.